You'll be getting Lady, the first book I've written for women. I harness nearly 20 years of experience on dating women to helping you find a a good man for the purpose of love and family. 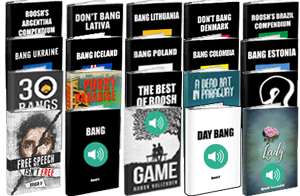 Get my newest book Lady, all of my travel guides, my five memoirs, my three best-selling game books (Game, Bang, Day Bang), my best-of compilation, and four audiobooks in MP3 format. That's 30 hours of recorded narration and 2,593 pages of life-changing content. Save over 80% off the regular price!